The speaker for the March Draper Museum Lunchtime Expedition, Public Relations Specialist and Dino-educator, Andrew Rossi, of the Wyoming Dinosaur Center in Thermopolis, Wyoming, really got me thinking. Recently he generously took time from his busy schedule to show a few of us around the Wyoming Dinosaur Center. There were so many interesting things he was able to show us and teach us about dinosaurs in Wyoming. Did you know that we have dinos in the Draper Natural History Museum? The museum may be more well known for plants and creatures that teach our visitors about the Greater Yellowstone Region as it is now, but no one who sees the diverse life here now should be surprised that we had diverse life way back then too! It’s time we show it off! Why are Dinosaurs Important to Wyoming? In 1891, Othniel C. Marsh described the main ichthyosaurs and plesiosaurs from the Sundance Formation in the Bighorn Basin. These reptiles lived in a shallow, inland sea that covered the area about 150 million years ago. The fossil remains of squid-like creatures, several fish species, clams, oysters, and crinoids are commonly found with these dinosaurs. Many years later, the Buffalo Bill Center of the West’s first director was a fossil hunter! 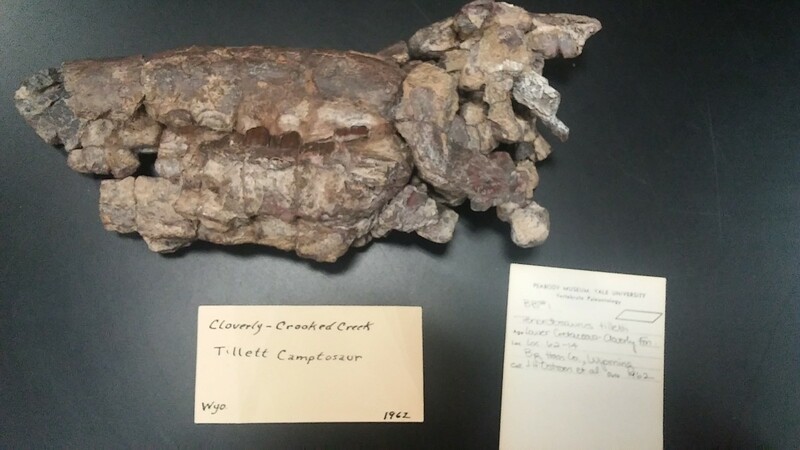 Dr. Harold McCracken, founding Director of the Whitney Gallery of Western Art and the Buffalo Bill Historical Center, discovered a partial Tenontosaurus specimen in the Bighorn Basin in the early 1960s. He and other Cody fossil hunters helped paleontologists from Yale University excavate the specimen. Until 2010, the specimen was housed and studied at Yale University. Several scientific papers and a book have been published from these studies, and the specimen is now housed in the Draper Natural History Museum collection. In 1994, about a year after the release of ‘Jurassic Park,’ Wyoming Legislators decided to claim a state dinosaur. The 1994 state statute declares, “A state dinosaur shall be designated by election according to law. The results of the election naming the state dinosaur shall be filed with the Secretary of State.” The Triceratops was voted the winner of the election by Wyoming elementary school students! You won’t have to look very far to find dinosaurs in Wyoming! The Bighorn Basin itself is a treasure chest for fossils! The Cloverly Formation dates to the Lower Cretaceous period, about 110 million years ago. The sandstone formation is exposed in much of the Bighorn Basin. It contains abundant dinosaur remains, primitive mammals, lizards, turtles, and lungfish. The most common dinosaur in this formation is Tenontosaurus. Paleontologists have studied the rich fossil-bearing rocks of the Bighorn Basin since the 1870s. One of the richest dinosaur bone beds in North America is found here. It is dated to the Jurassic period making it about 150 million years old. The well-known dig-sites in the Bighorn Basin include the Howe Dinosaur Quarry near Shell, Wyoming, and the Warm Springs Ranch Dinosaur Quarry near Thermopolis, Wyoming, which is administered by the Wyoming Dinosaur Center. 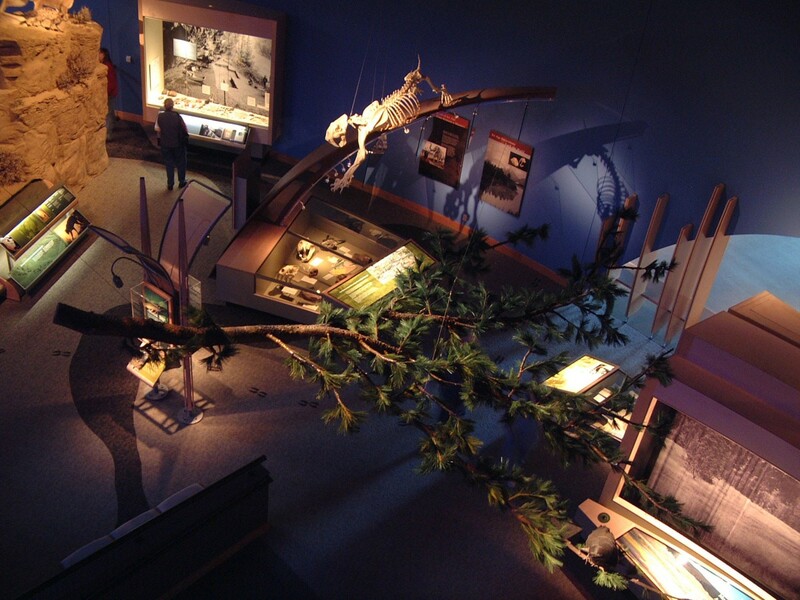 The juvenile Allosaurus visitors see in the Draper Natural History Museum was a gift of the Wyoming Dinosaur Center. It was discovered in 2002 at the Meilyn Quarry near Medicine Bow, Wyoming. The Allosaurus skull reproduction on display in the same exhibit is a loan from the Bureau of Land Management Cody Field Office. Paleontologists nicknamed this dinosaur “Big Al.” They discovered the fossil near Shell, Wyoming, in 1991, and recovered approximately 95 percent of its remains. Big Al is the most complete skeleton of an Allosaurus ever found! This formation is also from the Jurassic period. The Sundance Formation is one of the largest exposed dinosaur trackways in North America. It is located on hundreds of acres of public and private lands west of Shell, Wyoming. The 40 acre Red Gulch Dinosaur Tracksite is managed for the public by The Bureau of Land Management. It contains thousands of tracks preserved in the Middle Jurassic Sundance Limestone about 167 million years ago. This was once an exposed mud-flat along the Sundance Sea. Small bird-like dinosaurs less than seven-feet tall made most of these tracks. The Triassic Chugwater Formation, around 210 million-years-old, holds few fossils, except for some interesting amphibian tracks that have been collected near Lysite, Wyoming. The brick red siltstone with thin bands of gypsum in the formation suggests a time of arid, desert-like conditions in ancient Wyoming. The Pleistocene Epoch was an age of ice and giant mammals. It was characterized by alternating cool (or glacial), and warm (interglacial) periods. This epoch lasted roughly from 1.8 million to 10,000 years ago. During the glacial periods, massive glaciers formed, and sea levels dropped dramatically. Popular scientific theories suggest that between 30,000 and 12,000 years ago, humans immigrated to America from Eurasia by boat and possibly by foot across exposed land bridges. In the western interior of North America, the immigrants found landscapes occupied by elk, grizzly bear, and other familiar animals. They also found now extinct animals such as the Colombian and wooly mammoth, saber-toothed cats, American lion, American cheetah, dire-wolf, camels, and horses. The saber-toothed cat scientifically named Smilodon is just one of many kinds of Ice Age saber-toothed cats. Smilodon fossils have been found in sites west and south of the Greater Yellowstone Region in Idaho and Utah, but the distribution of this big cat within our region remains unknown. The American cheetah was incredibly fast, and their main prey included pronghorn or antelope as locals know them. This caused antelope to adapt, becoming one of the fastest land animals in North America reaching speeds up to 60 mph. American cheetah bone deposits have been found in Natural Trap Cave near Lovell, Wyoming, in the Bighorn Mountains. The American lion was enormous in size. The males were nearly 25 percent bigger than male African lions. A 35,000-year-old frozen bison carcass from Alaska shows that the lions ate bison in addition to horses. With so many sites in Wyoming unearthing hundreds if not thousands of amazing fossils it may surprise you how few of Wyoming’s dinosaurs are here in Wyoming! Wherever you may visit or live in Wyoming, you could be the next discoverer of a history-changing artifact! We have dinosaurs, yes, and so much more. Working together, programs and artifacts like those presented by both the Draper Natural History Museum at the Buffalo Bill Center of the West and the Wyoming Dinosaur Center, are helping to bring awareness and inspire stewardship of these discoveries. It is important that we show our region what to do when an artifact is discovered, how to protect the discovered artifact, and how to protect the discovery site. Groups such as Citizen Science lead the way! They have been in the process of excavating a Camarasaurus that is now being gathered and preserved at the Wyoming Dinosaur Center. What you see on display there is 90 percent real dinosaur bone, while they’re still searching for and researching the other 10 percent! What is really important about discovering these artifacts and preserving them, is their story. The stories in the bone not only tell us fun facts about the habitat each dinosaur lived in, the food they ate, and how big they were but also how they as individuals lived and died. Past injuries and healing evidence in the bones can tell paleontologists about a dinosaur who liked to pick fights, or maybe was always fighting off predators or maybe the dinosaur was just clumsy! The bones also carry stories of disease, hunger, and survival. Where the dinosaur was found and what it was found with can be a big part of the story too! Maybe this was a Mamma dinosaur protecting her young! How an artifact is found can change the story drastically. Whether you live here in Wyoming or are visiting us this summer, allow the Buffalo Bill Center of the West to introduce you to a time before the buffalo! Dig a little deeper with our friends at the Wyoming Dinosaur Center! 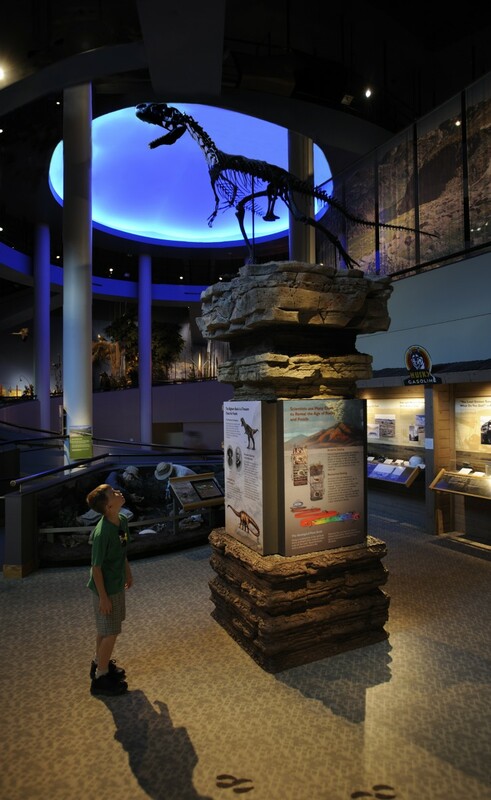 Receive a dollar off admission per person at the Center with your Wyoming Dinosaur Center receipt through September 31, 2019!! !